FRANKFURT/LONDON • London remains the globe's most attractive financial centre despite Britain's looming departure from the European Union, according to a semi-annual survey released on Monday (Sept 11). Britain's departure from the trading bloc has led to some politicians and economists predicting that London will lose its pre-eminent status as a financial centre, but there are few signs of that happening yet. New York was 24 points behind the British capital, the biggest gap between the two since the Z/Yen global financial centres index started in 2007. The index ranks 92 financial centres on factors such as infrastructure and access to high-quality staff. Hong Kong snuck ahead of Singapore by a margin of only two points on a scale that runs to 1,000. 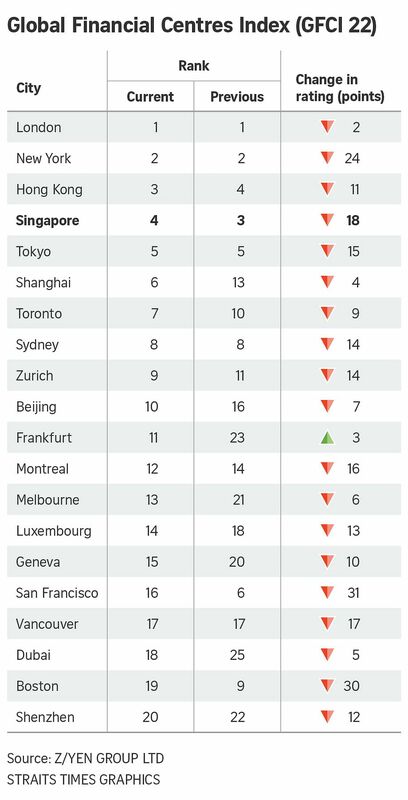 Asia-Pacific saw six cities in the top ten list fell across the board, led by Singapore and Tokyo which lost the most points. The region's poor showing marks a reversal of the gains made during 2015 and 2016. On the bright side, when asked to identify which centres are likely to become more significant in the years ahead, six of the top nine cities chosen in the survey are in Asia Pacific with Shanghai, Qingdao and Singapore bagging the top three spots. New York fell 24 points from last year, the largest fall among the top contenders, a dip the survey's authors said was "presumably due to fears over United States trade". Since becoming US President in January, Mr Donald Trump has pulled out of a trans-Pacific trade agreement and is pursuing a more isolationist economic policy. Britain's most powerful financial lobby group, TheCityUK, cautioned against complacency and called for clarity on its transitional arrangements for leaving the EU, which will apply beyond April 2019, when Britain is due to formally leave. "Absent this, many firms have already started to activate their contingency plans and others will undoubtedly follow suit if these aren't confirmed as soon as possible - and by the end of this year at the very latest," said Mr Miles Celic, the group's chief executive officer. Since the survey was conducted in June, talks between Britain's Brexit Minister David Davis and his opposite number at the European Commission, Mr Michel Barnier, have become increasingly acrimonious. The past two months have also seen a pick-up in the number of banks saying they plan to set up new EU subsidiaries after Brexit, with most major US, British and Japanese banks saying they will establish units in Frankfurt or Dublin. Frankfurt has moved up to 11th from 23rd and Dublin has moved to 30th from 33rd in the rankings.